It’s been awhile since we’ve shared any homeless tales. 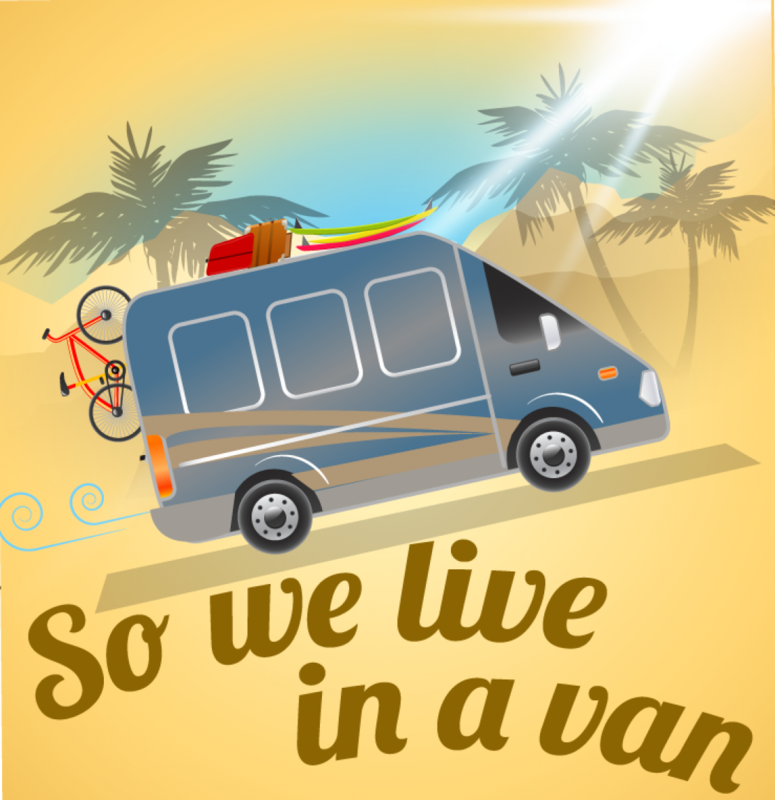 Therefore I am going to publish a three-part series over the next few days for give you all a glimpse of life in the van. Trying to stay inconspicuous, we get ready for bed using only a dim light. This means a lot of bumping into each other while fumbling to get our clothes put away, teeth brushed and pills swallowed. Wake up to the sound of teenagers laughing loudly while walking to the beach. Wake up to the sound of teenagers singing songs loudly while walking to the beach. Wake up to the sound (and smell) of teenagers smoking pot loudly while walking to the beach. We’ve considered calling the cops to complain about the noisy intruders, but then we think better of it. We tease about yelling out the window, “GET OFF OUR PROPERTY!” which, at two in the morning is so funny we have to muffle our laughs because another group of teenagers is walking by. I get thirsty, climb over Levi and chug from an enormous, gallon-size water jug almost too heavy to lift. I spill a bunch on myself and on the carpet. Savagely, I wipe my arm across my face, then drink some more. This sloppy desperation feels very homeless of me and I’m ashamed. But whatever, no one is watching. Wrong. Levi is. And although he is groggy, he is still clearly turned off. Now that Levi is up, he realizes he needs to pee. He tosses around hoping he can sleep through it because getting up to pee in the middle of the night while living in a van feels a lot more like getting up to rob a bank. You have to be on the constant look out, and you can’t get caught. And you may get arrested. Levi gets up and I realize I should just go too because I’m going to have to pee too after all that water I just drank. After properly surveying the scene, and waiting for more teenagers and dog walkers to pass by (I guess even the Beachfront Bourgeois suffer from induced insomnia), we finally make sure the coast is clear (literally), and head to the dirt edge of the sidewalk. The next part is pretty straightforward for Levi. I, on the other hand, had to invent a new female urinating tactic by carefully squatting over the curb to prevent any back splash. It really works! I pee with the pride of a newly potty trained three-year-old. We relieve ourselves side-by-side in the moonlight in a sort of weird bonding ritual while each of us watches our zone to make sure no one is coming. Oddly, a lot of times someone isn’t far off. Will no one ever sleep?! I wipe. He shakes. And we both smile for being sneaky pee-ers. Then we’re off to bed at last to fall fast asleep. That is until the early bird seniors come out for their 5 a.m.morning walks. Haha, this is hilarious. Your posts are like crack, keep the supply coming! 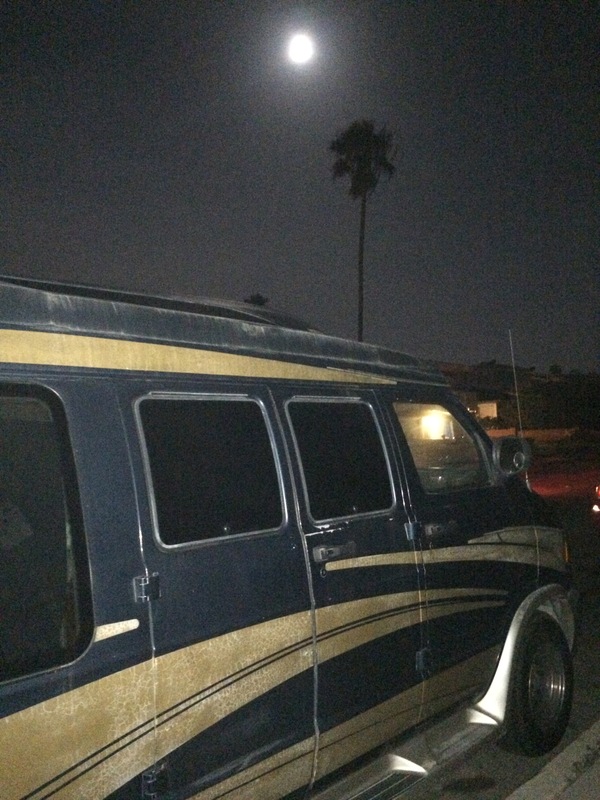 About the noise and losing sleep thing: Why don’t you guys try to make your own noise in the van? (Not going where you think I am with this…) Get some fans that are just loud enough that they drown out the outside noise, but quiet enough to not give you a headache. This is what I opted to do and it worked like magic! I spent $50 for two fans, rechargeable Li AA batteries and a charger on Amazon. I’m back at home after my summer of urban sailing, and I hate being at home already! Gross!! Don’t tell us pee stories. I have four boys- I live pee stories!